From my notes I present an edited Bible Study from Sunday . 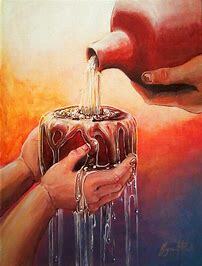 Early in the Bible (Genesis 28:10-22) we find the first mention of Anointing. Jacob poured oil on the stone he had used as a pillow, and made a vow to give God a tenth of what ever he would be blessed with; if God would be with him and safely return him home again. 1. Exodus 30:22-23 God gave Moses a recipe for the anointing oil: Five spices in varied amounts added to a larger amount of olive oil. This sacred oil was to be used in the anointing of items in the tent tabernacle. 2. Leviticus 8:30 The oil mixed with blood from the altar was used to sanctify Aaron the priest and his sons, as it was sprinkled on them and their clothing. 3. I Samuel 16:10-13 God commissioned the Prophet Samuel to visit Jesse and God would show him who was to become the next king. Each of the sons were handsome and sturdy but they were not the chosen one. Samuel said, is there another son? Yes, but he is the youngest and is a “Shepherd,” and cares for the sheep. God was looking on the heart and not the outward physical being, as David had a heart after God. Samuel was pleased to anoint David to become the next king. 4. Psalms 23:5 Oil is used for healing, as the shepherd anoints the head with oil to hurts from rubbing heads with other sheep. The oil would also be applied to the nose to prevent the nose fly from laying eggs in the sheep’s moist nose. 5. John 3:27-30 Who is the anointed one? John declared it was not him, but Jesus. Luke 4:18-20 Jesus was anointed by the Holy Spirit: “The Spirit of the LORD is upon me, because he hath anointed me to preach the gospel to the poor; he hath sent me to heal the brokenhearted, to preach deliverance to the captives, and recovering of sight to the blind, to set at liberty them that are bruised, To preach the acceptable year of the Lord. And he closed the book, and he gave it again to the minister, and sat down. And the eyes of all them that were in the synagogue were fastened on him. 6. 1 John 2:20-29 “But the anointing which ye have received of him abides in you.” You can hear from God for yourself, by listening to His still small voice in your heart. You can know what God is doing and how He desires you to join with Him in Ministry. When God corrects us, he then heals us with the oil of the Holy Spirit. Pray for those who persecute you. We don’t know the entire story of the situation they face. Give them the benefit of the doubt and pass over judgment. Proverbs 3:7-12 Don't be impressed with your own wisdom. Instead, fear the LORD and turn your back on evil. 8Then you will gain renewed health and vitality. 9Honor the LORD with your wealth and with the best part of everything your land produces. 10Then he will fill your barns with grain, and your vats will overflow with the finest wine. 11My child, don't ignore it when the LORD disciplines you, and don't be discouraged when he corrects you. 12For the LORD corrects those he loves, just as a father corrects a child in whom he delights. 7. Jesus is the Good Shepherd and gives His life for His sheep. (You and me.) 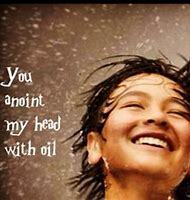 He anoints our head with the Oil of the Holy Spirit. Our teacher passed from one to the other, a small jar with oil and we were to dip our finger in it and rub it into our hands. Then we joined hands and a closing prayer was said. The anointing was a communion and bonding as we joined hands.